Hello all, im fairly new at the building my own gaming computer rig, just started. So here's my problem. screen would stay black. No booting to BIOS or anything! an error message saying something about Debugging, (I don't know what that is). Any ideas on how to fix this? Or how to even start troubleshooting this? to go and do that. be reading books every week to see whats new and what the new acronyms are...Grrrr!! Both your memory kits are the same? What is the model(s)/part number? In waht slots you had the memory installed with 3 sticks only? What is the board revision(printed above the afr PCIe slot I/O panel side) and what the BIOS version installed? Is XMP enabled in BIOS or not? Don't know the BIOS version, or if XMP is enabled. cant access BIOS at all. So you added the ram in slots 2, 4 and 6? because you wrote 4, 5 and 6. Take the new sticks out, and check BIOS version, XMP is probably not available as these are DDR-1333. Try increasing QPI/VTT to 1.3v/1.35v, save and reboot, shut the PC down and add the new memory. Also disable full screen logo(Advanced BIOS features) so you can see where exactly what stage it stuck. EDIT: also check BIOS HW monitor for applied memory voltage. If you continue to have issues entering the BIOS try using a different keyboard, or a PS/2 one if you are using USB KB now. As for easytune, you must uninstall your current version to update it, then install the latest from here. And also be sure you have all the latest windows updates installed too, including the optional .NET ones. Hmm, Ill run an update check on everything, but I'm pretty good on keeping up to date on things. the text, all I could read before it started was Mem - good - ok or something like that. option I have is to try again, but it doesnt work. Not really sure what to try now. Idea's? 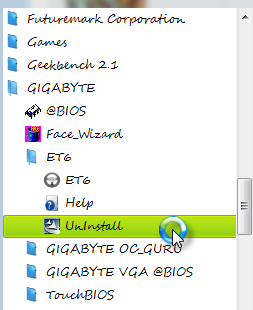 To uninstall easytune, open the Gigabyte start menu folder, then ET, then there will be an uninstall link. If you continue to have this error, show me pics of it, and show me pics of where and how you are trying to uninstall it. I'm not familiar with those memory versions, but I do know that Corsair uses different versions for different chips, so those may or may not work together smoothly or at all. Last edited by Lsdmeasap; 01-29-2012 at 03:57 PM. One step at a time, do you have the whole 6 modules installed and running now(e.g. windows sgows 12GB memory). Did you check applied memory voltage in BIOS HW monitor? If it's over 1.5 by much try setting DRAM Voltage manually to 1.5-1.52v. IMO it would be a good idea to use the same modules in each channel possible, so it will be one channel ver. 2.13 second channel ver. 2.3 and the last channel mixed. I have the same motherboard as you and am using 1600 DDR3 ( 3 sticks for a total of 6g ). I did the same thing as you ( and actually a good friend of mine with this board also did this) and thought of upgrading to 12 g and bought the exact same modules and put in my machine and it was very unstable. It turns out that the best thing to do was to buy the whole kit as one, even if the modules are the same but made at different times, it was said it "could" cause some issues. There are some post somewhere on this site regarding this.